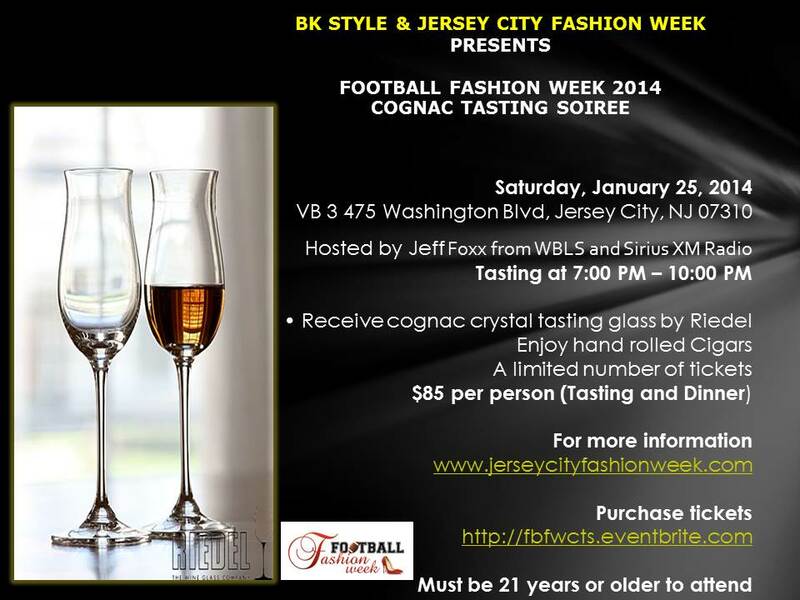 Description In light of the Super Bowl coming to New Jersey JCFW will celebrate fashion and sports during our fashion week. Please come out to see athletes, socialize, shop and give back to the community! Stay tuned for more details! A portion of the proceeds will go to Jersey City Recreation Foundation to support the Flag Football team (NFL 60 team) and Baseball team for youths in the community, NY/NJ Snowflake Youth Foundation. This foundation is an initiative of the NY/NJ Superbowl Host committee and provides funding to the NY/NJ area after-school clubs and community centers and Gridiron Gang (Giving Athletes/Adolescences New Goals) This is a group of former NFL Player’s institute that provides football camps, training and encouragement to children in need. Fashion, Athletes and New Jersey Perfect Together!! 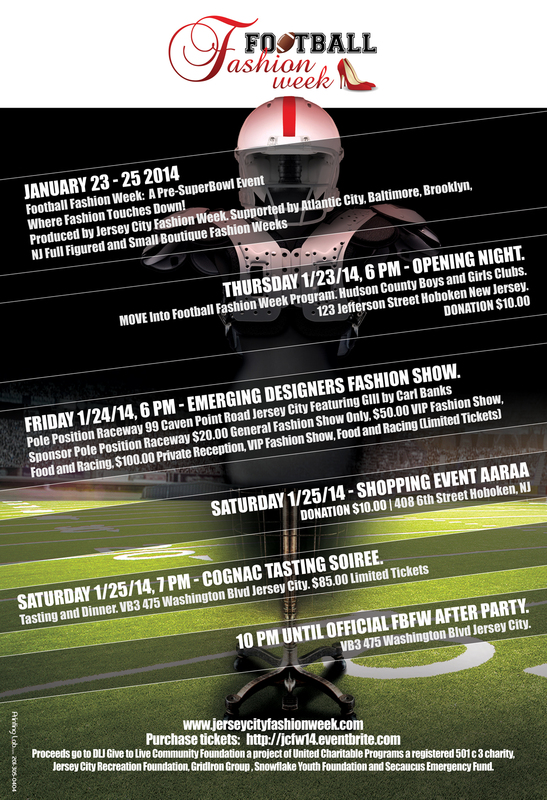 See listing of Football Fashion Week events and other events happening during the weeks leading up to the Superbowl at Visit Hudson. Tickets on sale now at http://jcfw14.eventbrite.com! Interested in sponsoring this event please contact the FBFW Coordinator at jcfw@dljsec.com. Proceeds from these events will go to DLJ Give to Live Community Foundation, Jersey City Recreation Foundation, NY/NJ Snowflake Youth Foundation, Gridiron Gang, Secaucus Emergency Fund and the BK Foundation. MOVE into Football Fashion Week!! Presented by 99 Ways Entertainment and Siomara “Cee Cee” Bridges M.O.V.E Bridges Dance Project. Liberty Science Center will also be a part of the program. Come join us as we kick off the fashion festivities. Get a sneak peak of the designers, fun things for kids and much more as we celebrate fashion and the Super Bowl! Ms New Jersey USA Emily Shah and Ms New Jersey Teen USA Valentina Sanchez will appear. This event is free! Suggested donation of is $10.00. Please register on eventbrite! Come support emerging designers, eat, race and have fun! We will feature casual, swim, resort and sportswear for both men and women. It is anticipated that professional athletes will walk the runway and exhibit their developing fashion lines as well. More to come… Tickets are $20.00 General Admission Fashion Show only, $50.00 for VIP Food and Racing, $100 VIP Private Reception with celebs. Includes the show, entertainment, racing and more… Tickets available on eventbrite. GIII Sports by Carl Banks will be featured as part of our showcase along with other top designers!! [size=medium]"True Ink" A Luxury T-Shirt Brand by Ray Edwards will also be showcased on 1/24! Mr. Edwards is a professional boxer. Former NY Giants Super Bowl Champion and San Francisco 49er Odessa Turner and Darrell Reid Indianapolis Colts Super Bowl XLI Champion and former Denver Bronco will walk the runway!! Ms New Jersey USA Emily Shah and Ms New Jersey Teen USA Valentina Sanchez will host red carpet on 1/24 at the show. Confirmed Former NFL Player from the Tennessee Titan Visanthe Shiancoe and Jason Case and Amy Diaz from Amazing Race! Mister Cognac, Paul Jones of JTE Spirits, will present a collection of the worlds finest Cognacs alongside dinner. Hand rolled cigars also being offered. Join supporters, celebrities, athletes and more at this VIP event! Tickets are $85.00 to attend. Tickets available on eventbrite. Hosted by Jeff Foxx from WBLS and Sirius XM Radio, BK Foundation and Jersey City Fashion Week!! Tickets on sale now at http://jcfw14.eventbrite.com ! Tickets also available at Pole Position Raceway 99 Caven Point Road, Jersey City, NJ. Tickets now also available at Street Fame Barber Shop 537 Newark Ave. Jersey City NJ 07306. Ask for Kenny! Sponsors and Supporters include Pole Position Raceway, White Castle, United Charitable Programs, Atlantic City Fashion Week, NJ Full Figured Fashion Week, BK Style Foundation the producers of Fashion Week Brooklyn, Small Boutique Fashion Week, DLJ Sports and Entertainment Connection, Jersey City Fashion Week, GLAAM, Kiss-A-Star Photography, VB3 Restaurant and Bar, Fefe Makeup Artistry, DLJ Give to Live Community Foundation, Atangerinetree Boutique PR |Media and Production House, Boys & Girls Clubs of Hudson County, Liberty Science Center, Fashion Umbrella the producers of Baltimore Fashion Week, Kay Unger New York, World Cast Inc.
Modell's is a proud supporter of Jersey City Fashion Week and Football Fashion Week! Sign up for our newsletter http://eepurl.com/IlO2r! Press,photographers and bloggers should contact Media Relations Coordinator George Walker at jcfwpress@dljsec.com or 914-450-1695 or Publicist and Media Coordinator Britney Medich at Britney.Medich@gmail.com or jcfwpress@dljsec.com. Donate now to DLJ Give to Live Community Foundation!! Give to Live is the main entity behind Jersey City Fashion Week. Our mission is to raise funds and awareness as well as to support charitable causes, events and needs of people in some of the following areas: sports, athletics, education, religion, poverty, homelessness, socio-economically depressed areas, law enforcement, the arts, sick and disabled people, children,young adults, students, women and the elderly through fashion, sports and entertainment. Donate $10 or more today!! Give to Live and support our mission today!